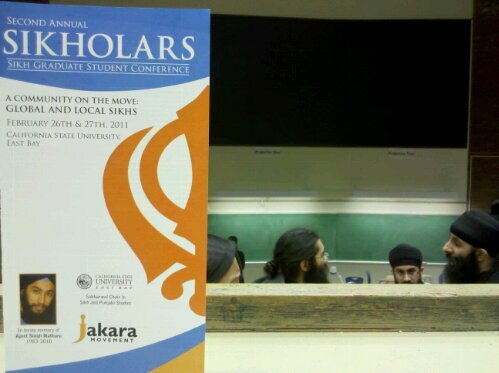 Last weekend, I was fortunate to attend the second annual Sikholars: Sikh Graduate Student Conference, a two-day event at California State University, East Bay. I also attended last year’s conference when it was held as a one-day event at University of California, Stanford. While not a formal scholar myself, I have a great interest in Sikh studies, and this conference provides a glimpse of the great academic work being done by Sikhs and non-Sikhs in the United States and around the world. This year, Sikholars was presented by Jakara Movement, the Ethnic Studies Department at CSU East Bay, and the Sabharwal Chair in Sikh and Punjabi Studies. So not to steal the thunder of the organizers, I won’t go into a detailed summary of every presentation/discussion – the range of topics were vast and there was considerable depth to each of the individual presentations – and I’m sure they will do a much better job to capture the essence of the conference (as they did last year). However, for now, you can view the abstracts for the papers presented in this year’s conference at the Sikholars website. This year, the presentations were grouped along several themes: historical research, Sikh influences in art and architecture, topics related to the Sikh family (e.g. raising a Sikh child, cultural gender bias in American Sikhs and in South Asia), the presentation of Sikhs in media and entertainment, the relationship between Sikhs and their temples in the west, and where the issues still unresolved from the events of 1984 stand today. Many of these presentations were very thought-provoking and forward-thinking. One of the most compelling thoughts that was discussed in this conference is that such a forum provides the opportunity for the open exchange of ideas and topics that we, as Sikhs – and particularly, young Sikhs of the diaspora – do not easily discuss elsewhere (for example, in our Gurdwaras). It is reminiscent of the miri-piri concept in Sikhism – that there is both a temporal aspect and spiritual aspect to our faith. The exchange of these ideas stimulates mobilization, and for all the discussion about disenchanted Sikh youth in the United States and otherwise, such a conference disproves that notion and is definitely inspiring. I have no doubt that these experts in their fields will continue to make major contributions to our community in the United States and worldwide. I was greatly impressed (and humbled) by the presenters who attended this conference and I hope to attend again in the future. I would encourage anyone who has an interest in research on historical or contemporary Sikh topics to keep an eye on this event, because it will be events like these that will allow us to chart our course through the future.